In October, Trump promised that with his victory, “we’re gonna be saying merry Christmas at every store. … You can leave ‘happy holidays’ at the corner.” Last week, Corey Lewandowski, a Trump adviser and former campaign manager, declared on Fox News, “You can say again, ‘merry Christmas,’ because Donald Trump is now the president. … It’s not a pejorative word anymore.” And Bill O’Reilly, a longtime “War on Christmas” combatant, has declared victory. Last year we analyzed public opinion on saying “merry Christmas” or “happy holidays” using data from a 2013 survey administered by Public Religion Research Institute (PRRI). On Monday, PRRI released the results of a December 2016 survey on the same topic, allowing us to compare how people feel about these season’s greetings over time. We can also see how those opinions compare to the presidential election results. In both surveys,2 PRRI asked a nationally representative sample of Americans whether retailers should greet their customers with “happy holidays” or “season’s greetings” rather than “merry Christmas” out of respect for people of other faiths. 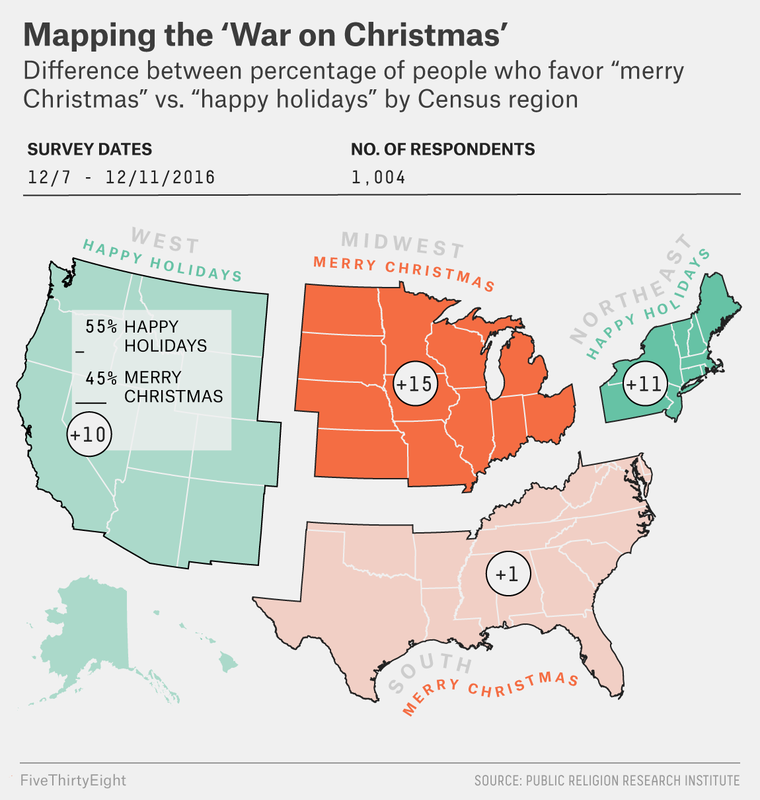 In both years, white evangelicals strongly favored “merry Christmas,” while secular respondents prefer “happy holidays” or “season’s greetings.” But the “War on Christmas” does not divide people simply along religious lines — there are also regional differences. In both 2013 and 2016, the weakest support for “happy holidays” and “season’s greetings” was in the Midwest (42 percent in 2016), not the South (50 percent), as you might have guessed. Although both regions have large evangelical populations, the South is also home to a large percentage of the country’s African-American population, and that group strongly prefers “happy holidays” (72 percent in 2016) despite their high levels of Christian religiosity. Support for “happy holidays” decreased somewhat in both regions this year compared to 2013. In 2013, however, support for “happy holidays” dropped dramatically among secular citizens in largely nonreligious states like Oregon. We attributed this to Christmas being more cultural than religious in those states. Yet, in 2016, support for “happy holidays” seems to have grown in more nonreligious states, with support for the greeting rising in the West from 51 percent to 55 percent, mirroring the rise in support among those who claim no religious affiliation (58 percent in 2013 to 64 percent in 2016). Preferring “merry Christmas” or “happy holidays” is quite political, as Trump and Lewandowski know well. In both 2013 and 2016, Republicans across the country were the strongest and most consistent in their opposition to “happy holidays.” But we did see a change this year at the intersection of religion and politics. In 2013, evangelical and non-evangelical Republicans were equally likely to support “happy holidays” — around 29 percent. This year, however, evangelical Republicans’ support for the more inclusive salutation weakened to 22 percent, while non-evangelical Republicans were more likely to embrace it (35 percent). 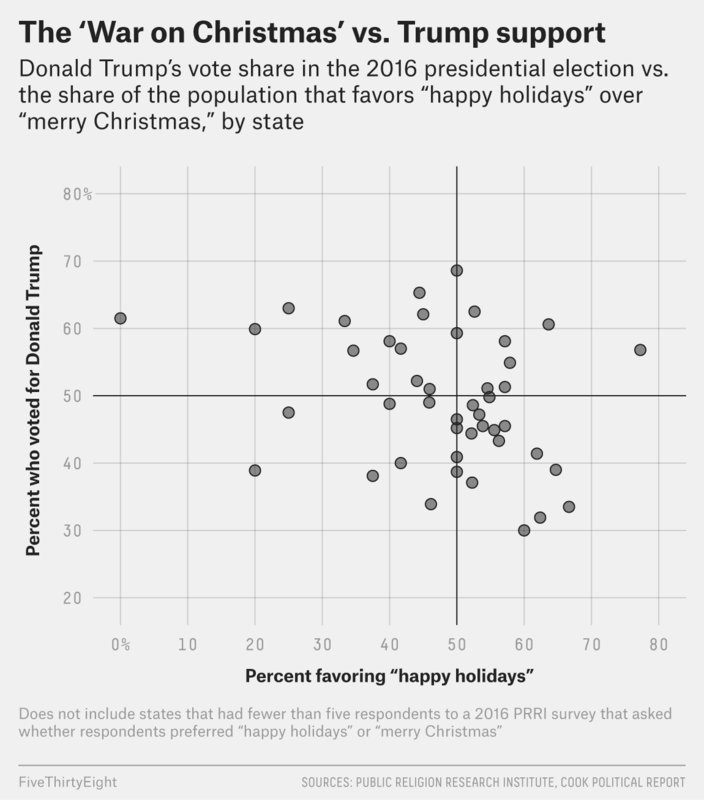 Trump performed a bit better in states where people were more opposed to “happy holidays,” though the evidence for a relationship between the two factors is weak and the data is noisy. However, Trump did outperform his polling in the Midwest, the region where opposition to “happy holidays” is the strongest. And it is mostly Southern states — which have large but non-majority African-American populations — that show more support for “happy holidays” while also supporting Trump. The “War on Christmas” helps illustrate the cultural divide that was key to the 2016 election. Trump’s emphasis on cultural threat, including his calls for people to say “merry Christmas,” tapped into existing Republican angst, which heightened white evangelical concerns and mobilized support in largely white Midwestern states. The corresponding backlash from the left helps explain why more Democrats, secular people and Westerners grew in their preference for “happy holidays.” As the “War on Christmas” becomes increasingly political, perhaps we will see more Christmas skirmishes in the next few years. The whole thing tends to be overblown by the media and politicians: 83 percent of respondents said they were not personally offended when someone says “happy holidays” to them, according to a 2016 Public Policy Polling survey. The surveys were conducted in Dec. 4-12, 2013 and Dec. 7-11, 2016, with samples of 1,056 and 1,004 respondents, respectively. For this analysis, we weighted PRRI’s data sets to make them nationally representative. This produced slightly different regional numbers than those shared in last year’s post, but it allows us to keep the comparisons of 2013 and 2016 consistent. Andrew R. Lewis is an assistant professor of political science at the University of Cincinnati. He has published research on religion, politics and law in the United States.